Serious slurping ahead at the 2013 Arcata Main Street Oyster Festival. 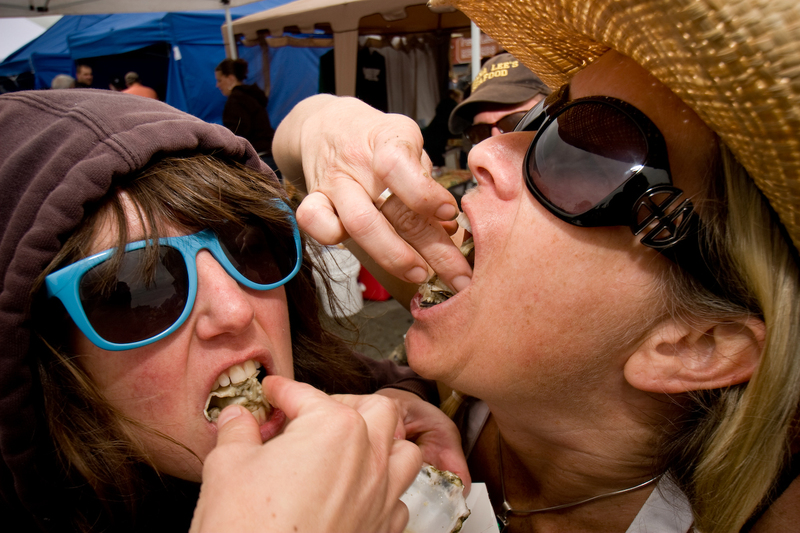 Are you ready to shuck and swallow some of the freshest Oysters at the 23 annual Arcata Main Street’s Oyster Festival? Come on down to the Arcata Plaza on Saturday, June 15, 2013. The Oyster Festival will once again highlight and celebrate the plump and sweet Kumamoto oyster, raised and grown directly in Humboldt and Arcata Bays. More than 30 culinary vendors will set up shop on the Plaza cooking everything up from raw and barbecued oysters to hot dogs to sushi as well as all kinds of Asian cuisine. Even if you don’t like oysters, there will be other succulent creations and food delights from our area’s best chefs for you to try. The Oyster Festival will operate a little differently this year. Due to organizational budgets, festival management and attendance, safety concerns and increasing costs, Arcata Main Street will charge a $10 entrance fee to enter the festival grounds surrounding the Arcata Plaza. There will be no charge for beer wristbands. Arcata Main Street’s Board of Directors hopes the $10 entrance fee will change the dynamic and energy of the event, making it safer and more fun for all ages. In addition, the non-profit organization is working with the Arcata Police Department, the Arcata Fire Protection District and the City of Arcata to manage the large crowds and maintain the crowd’s civility as the event comes to an end at 5:30 p.m.
“The event in the past has experienced estimated crowds up to 16,000,” Arcata Main Streets Executive Director Jennifer Koopman said. The $10 entrance fee will also allow the Oyster Festival to reinvest in Humboldt’s aquaculture industry. Arcata Main Street has set up a support fund with Humboldt Area Foundation, where a portion of the proceeds will be donated back to local environmental projects. Arcata Main Street’s Oyster Festival started 23 years ago as a way to promote Humboldt’s aquaculture businesses. Over 70 percent of the fresh oysters consumed in California are grown in 450 acres of Arcata Bay. Arcata Main Street’s Board of Directors wanted to find a way to give back and to say thank you to all the oyster entrepreneurs in our area who ultimately want to develop and grow commercially viable, environmentally sound and culturally sensitive aquaculture businesses. It is because of these local oyster farms and companies that we are able to highlight one of Humboldt County’s sustainable food sources, as well as bring attention to our beautiful and delicious oysters on a national level. “Hopefully, with the additional funding raised from this year’s event, Arcata Main Street will be able to sustain itself for another year with the ultimate goal of being able to support downtown Arcata merchants,” Koopman said. Arcata Main Street will not only be able to continue to reinvest in the business community, but will continue to produce events like Arts! Arcata, Concerts on the Plaza, Trick or Treat Around the Plaza and the Season of Wonder & Light which all help foster a family-friendly atmosphere and community in downtown Arcata. “The potential increase in revenue from the Oyster Festival will not only allow Arcata Main Street to continue to invest in our local community with these type of events, but in other areas as well,” Matthews said. The organization is also making plans to set up a scholarship fund, to have more events on the Plaza as well as contribute more to Arcata Plaza’s beautification projects. “The money raised from this event will also help the organization be more self-sufficient,” Festival Planning Committee Member, Bill Chino said. Tickets are available on Hold My Ticket’s website, holdmyticket.com, and can be purchased in advance. Advance ticket sales will allow festival goers to enter the event more quickly, as the lines will move faster at all the four-corner token booths. Main Street has hired Select Bank Card to handle credit card transactions at the four corner booths. Local banks and tellers will donate their time working the corner booths to allow for quick entry. The festival will employ a local fence company, Craft Mart, to create a safer venue area. Children under 12 will still get into the event for free, $5 for kids ages 12 to 17, and if you’re bringing the whole family, an expanded kids’ play area will be located between Eighth and G streets. The organization will also use two shuttles from the City of Arcata that are free to festival-goers to help alleviate traffic and cars in the downtown area. The festival will continue to include award-winning, local microbrews from Lost Coast Brewing Company and Mad River Brewing Company as well as new selections from Sierra Nevada Brewing Company, Blue Moon Brewing Company and Crown Imports (Pacifico). Members of the California Conservation Corps will donate their time to help the festival with sanitation for the third straight year. Festival-goers who volunteer their time will receive free entry into the festival, an official Oyster Festival T-shirt, and a beer token ($41 value). Arcata Main Street employs local artists to submit their artwork for the official Oyster Festival poster every year. The 2013 Oyster Festival poster proudly features art by Arcata painter Joyce Jonté, who also submitted art for Picnics on the Plaza, Concerts on the Plaza and the Arts! Arcata posters. In addition to the grilled mollusks and frosty beverages, the event will also feature live performances by the quirky and danceable, Yogoman Burning Band from the Pacific Northwest as well as Humboldt’s own jazzy and funk band, Motherlode. A third band will be announced at a later date. The money raised from the event will also help the organization pay a sound technician, stage rental and to purchase much needed sound equipment to be used at other events and available for rent. In between the eating, drinking and slurping, KWPT 100.3 FM and 102.7 FM’s The Point presents their annual Shuck & Swallow competition where the 2012 defending champions, Aidan Semingson (the shucker) and Conor Eckholm (the swallower), go for yet another oyster knockout and gold belt. If you think you can beat this oyster shucking and swallowing dream team, contact The Point, to enter… if you dare! The event will also feature two other notable contests. The Oyster Calling contest will include both young and old participants who will try to yell out what an oyster would sound like if the oyster were to ask his friends to join him at the Oyster Festival. Listen to KGOE 1480 AM if you’d like to win a chance to be an honorary oyster judge for this unique contest, as well as free tickets to the event. Twelve judges will receive an official Oyster Festival T-shirt from Humboldt Outfitters. There’s also an oyster-food judging contest where three winners will receive a specially designed plaque from Humboldt’s own recycled glass company, Fire & Light originals. Festival organizers ask that you pay special attention to the recycling and trash bins throughout the event as almost every product at the festival will be recycled, recyclable or properly disposed. The recycled oyster shells will be donated to the local fish hatcheries. The California Department of Fish & Wildlife Mad River Hatchery will use the shells as biofilters for reconditioning of the water for the fish. The event begins at 10 a.m. and concludes at 5:30 p.m. All ages are welcome. All adults wishing to buy alcohol must produce and show current I.D. All non-refundable $6 beer tokens can be purchased at the four corner booths on the Plaza. All the funds raised at this annual event — from the beer tokens to the entrance and booth fees — will support Arcata Main Street’s non-profit organization. Your generous donations will keep Arcata Main Street and the Oyster Festival going for many years to come! Come down to the Plaza on June 15 and join us in our quest to consume thousands of oysters while supporting your community at the 23rd annual Oyster Festival. For more information, contact Arcata Main Street at (707) 822-4500, arcatamainstreet.com or on Facebook. This entry was posted on Thursday, May 2nd, 2013 at 2:58 pm	and is filed under News, Community, Scene, Animals, Business. You can follow any responses to this entry through the RSS 2.0 feed.